Here in Denver, one of the top flooring choices is hardwood, and with good reason. It’s stylish. It’s warm. It’s easy to maintain. And it looks great all year through. If you have hardwood floors throughout your home, you probably agree. Yet there may be certain areas of your home where hardwoods “bug” you a little more than they do in other places. Like in the entryway when people enter your home. Or in the kitchen where you stand to do the dishes each night. Or in the dining room where you gather for formal dinners. You love your hardwoods, but to have something softer, something that protects your hardwoods and makes the easier to maintain would be good too. That’s where area rugs come in to play. An area rug is a stylish way to add a splash of color, offer your hardwoods a little protection, and give you the softness and comfort level you’re going to love. But with so many styles to choose from, what do you do? Natural texture rugs are designed to keep things as simple as possible. Choose a natural fiber – how about jute – and choose a natural color to compliment your décor. Natural texture rugs mimic a handwoven look and feel that will warm any room in your home. For a thicker rug with a warm look and feel, incorporate a shag area rug into your décor. Shag rugs are the perfect choice for a living room or bedroom where you want to bring in warmth to the environment while adding a splash of color or design to the room. Think color. Think patterns. Think wow! European area rugs are some of our most popular rugs because of the variety. They are tightly woven and can withstand any abuse your family can dish out. They make great placements in high traffic areas, such as your entryway or a hallway. Looking for old world style? A traditional oriental rug can add elegance to your space. When you want to create a bold statement, choosing an oriental rug is a way to do it. Want something plain and neutral? Or how about wild and colorful? With today’s technology, anything is possible. 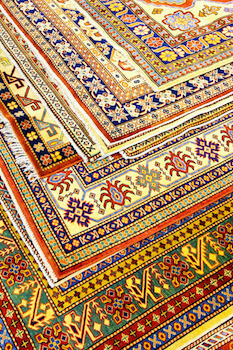 You’ll find rugs of every shape and size, in colors and patterns perfect to compliment your décor. If you are in the market for a new area rug for your home, measure your space and stop by. We can show you a variety of options – some you may have thought about and some to open up your mind to what is truly possible. With this many choices, you can have a new look and feel to your old space tonight!